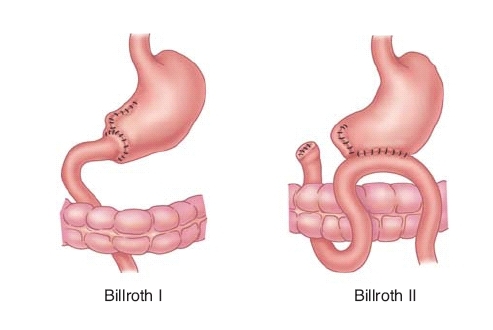 Billroth II, more formally Billroth's operation II, is an operation in which the greater curvature of the stomach is connected to the first part of the jejunum in a side-to-side manner. This often follows resection of the lower part of the stomach (antrum). The antrectomy (resection of the stomach antrum) is not part of the originally described procedure. The surgical procedure is called gastrojejunostomy. The Billroth II is often indicated in refractory peptic ulcer disease and gastric adenocarcinoma. It was first described by Theodor Billroth. ^ Billroth's operation II. Online Medical Dictionary. Centre for Cancer Education, University of Newcastle upon Tyne. URL: http://cancerweb.ncl.ac.uk/cgi-bin/omd?Billroth's+operation+II. Accessed on: February 11, 2008. ^ Billroth's operation II. whonamedit.com. http://www.whonamedit.com/synd.cfm/2731.html. Accessed on: February 11, 2008. Schematic of Billroth I & II - thefreedictionary.com.